CLAUDIAS GENEALOGY BLOG: ANOTHER NAUGHTON SISTER??? From the Irish Catholic Baptism records I knew my great grandmother, Bridget Naughton Dowd, had quite a few siblings. Their names and information has been a long time coming after a lot of research and serendipitous findings. I found a sister, Ann Naughton, who was Baptized 4 July 1862. Her parents were Thomas Naughton and Norah Molloy. None of the cousins, of which I have come in contact, ever mentioned Ann. Until a new cousin contacted me, via DNA match on Ancestry. We live in the same county and share about 45 cm. She had just begun researching and since her mother was adopted I focused on her dad's line. None of the names were familiar to me so I went to her female ancestors. 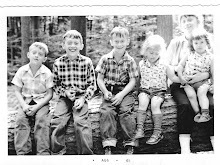 I came across a woman Mary O'Donnell with father named Coleman, O'Donnell and mother unknown. I was then back to my usual search sites and on Family Search I came across a marriage for Coleman O'Donnell and Anne Norton. They both lived in the same town as the rest of the Naughton siblings and Norton is an AKA for Naughton. In a search of the PITTSBURGH POST GAZETTE ARCHIVES I found an news story that Coleman O'Donnell had died in a railway accident in July 1895. 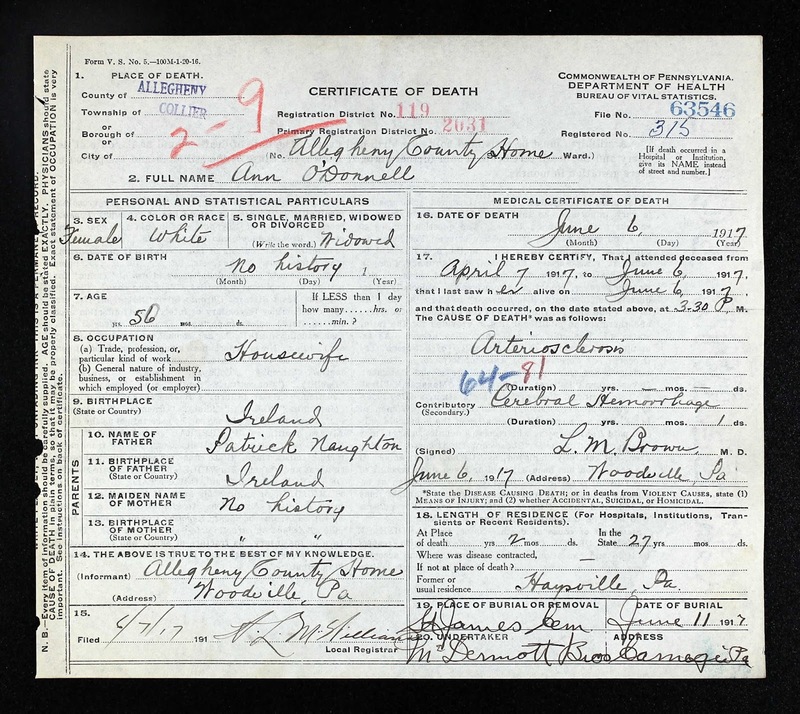 Next, I searched for Anne O'Donnell in the 1900 and 1910 census, but could not find her anywhere. 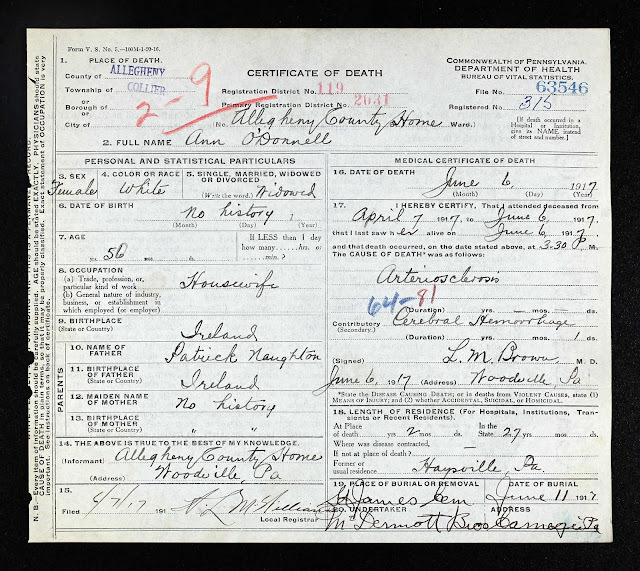 But after searching I came across what I believe to be her Death Certificate. She died at the Allegheny County Home, which also was a mental hospital and TB sanitarium known as Woodville. Cause of death appears to be a stroke. I found an obit from the Pittsburgh Post Gazette, which I believe is hers. Mrs Frances McCague was her cousin Margaret Naughton, daughter of her Uncle Coleman Naughton, her fathers brother. Why are not the names of her children or siblings listed? Was she estranged because of her time in the "Home." She had four children Sarah, Mary, Joseph Leo and Thomas, all who would have been adults at the time. Mental illness has a huge stigma now as well as then. I am 99% sure of this relationship because of a DNA match of a MS, who had a 45 cm. match with me.